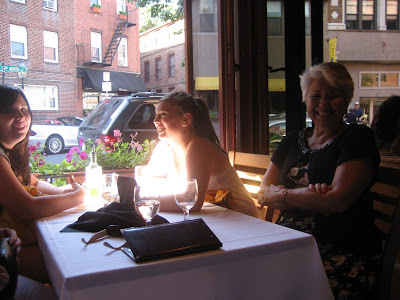 While in Boston, we saw lots of outdoor seating at restaurants and pubs. There were what I called "open air" restaurants where the entire front wall was open to the sidewalk. Myself and every child who came into one place we ate, were totally caught up with the whole thing. Call me a tourist! Step into the restaurant, step out of the restaurant. Yes. I am Ellie Mae Clampett. Back in Texas, we've been welcome with 103 degree weather. 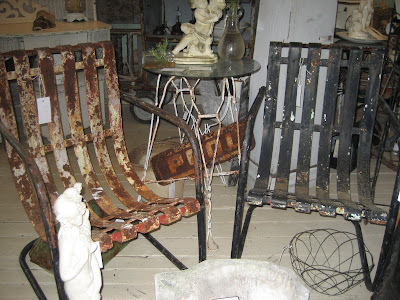 See these great metal chairs that I took to Winnie & Tulula's today? They are mighty comfy. I imagine around midnight in Texas, I would love to sit in one of these and enjoy me some mosquitos! Rather, they would enjoy me. It gets down to about 80 or so around that time, I think. Update: SOLD! 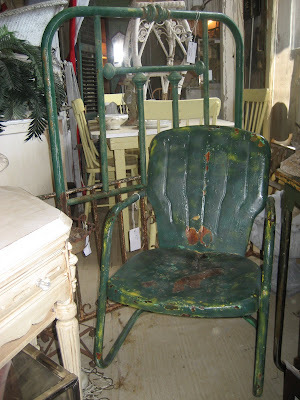 Here is another garden chair in my space at Winnie & Tulula's. I think the brass, green headboard would make a great garden trellis, don't you? Update: Green chair-SOLD! I'm hoping to hit some yard sales this weekend. Is there any hope of 2 digit degree temperature days in my near future??? One can only hope! Love that green headboard! Last night I finally made it over to David's blog and I was just mesmerized by all his photos of the W&T opening. The candidness of his camera and the seemingly oblivious faces made me feel like I was actually there. Just wonderful! You really do make the perfect couple. I'm so sorry that we didn't get to meet at Leola's last spring. Hopefully, another time. But you did wear shoes, right? Did y'all get to do any swimmin' in the hotel cement pond? Debra, thank you so much. I do believe David is the catch of the two centuries I have lived in! Love that pair of chairs!! OMG, no cement pond?! Tell me they at least had indoor toilets! I agree. That headboard WOULD make a great trellis! Candy and Amy...come to Texas! LOVE those metal chairs. I had a couple once. I miss them. Bet they'd keep your backend coolish in +100 heat. Glad you had a great trip, Mindy. Those metal garden chairs are fabulous! As I write this, it's 6:15am. The perfect time of day (in Texas) for sitting on the patio with my love. Nice and cool still. But, alas, you're not here. Bummer! I have a chair very similar to your green one in blue. I bought in at a yard sale for $5, but now I'm not sure what to do with it. It's a project for sure. It has peeling paint on the seat and some rust and it's missing a screw. I'm sure I'll get around to fixing it one of these days. I actually love these chairs and really do want to use it.